This small journal is hand-cut and hand-stitched with beautiful textured papers. 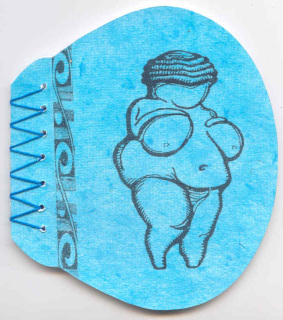 Found in Old Europe, the prehistoric "Venus of Willendorf" (circa 27,000 B.C.) is an ancient representation both of the Mother Goddess and Mother Earth, and is the very embodiment of fertility. Available in a diversity of colours, and also available as a miniature version with bead trim! Made from textured Thai or Japanese papers, hand-cut, hand-sewn, with soft covers, pages are blank. Please specify your color choice by e-mail. Size 4.5 X 5"
So cute! Hand-sewn, soft covers, pages are blank, bead trim, your choice of colors. Size 2.25 X 2.5"
​Please specify your color choice by e-mail.